Clipboards are one of my favorite decorating secret weapons. Clipboards are easy to find and they are really cheap. You can paint them. 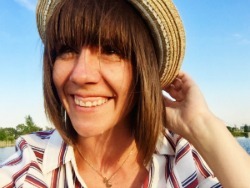 You can add a simple photograph. They can hang on the wall. They can sit on a shelf. Seriously, clipboards are the best. They aren't just for taking notes anymore. They are for leaving notes too. Love notes to be exact. 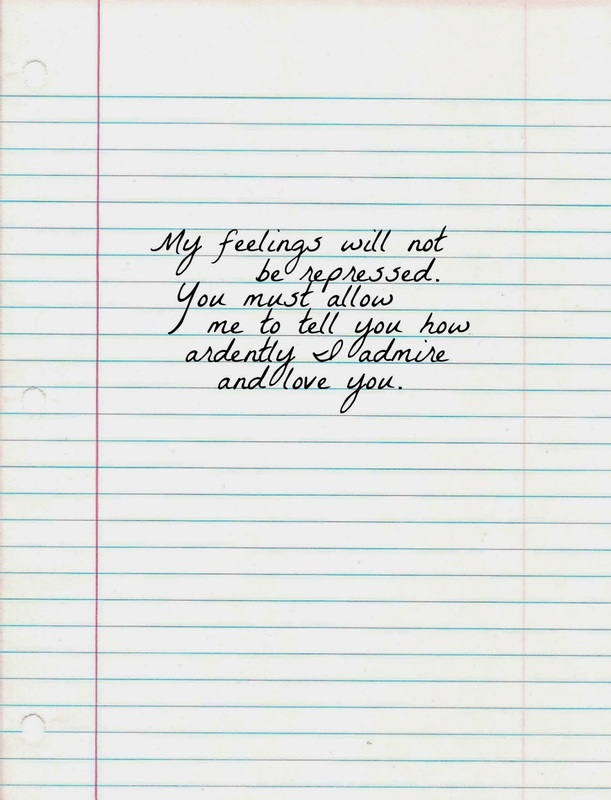 Love notes quoting the ever-dreamy Mr. Darcy to be more exact. Just the best love note ever. 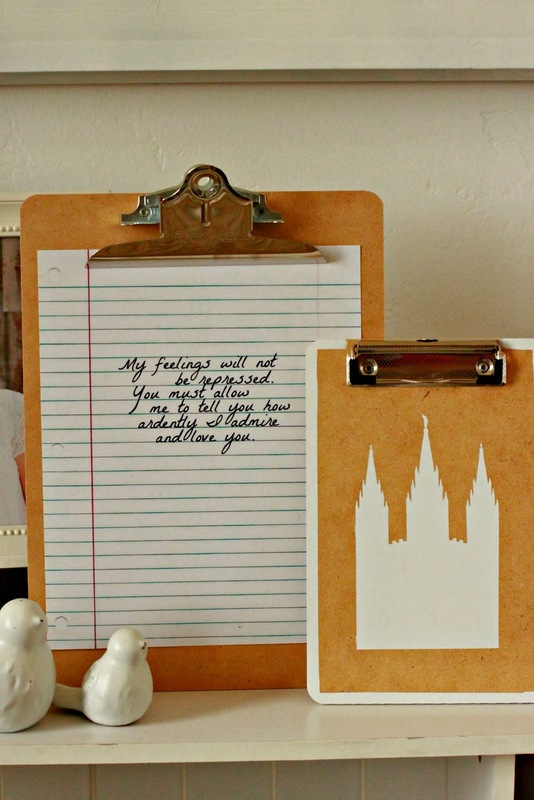 This love note is simply clipped onto the clipboard. 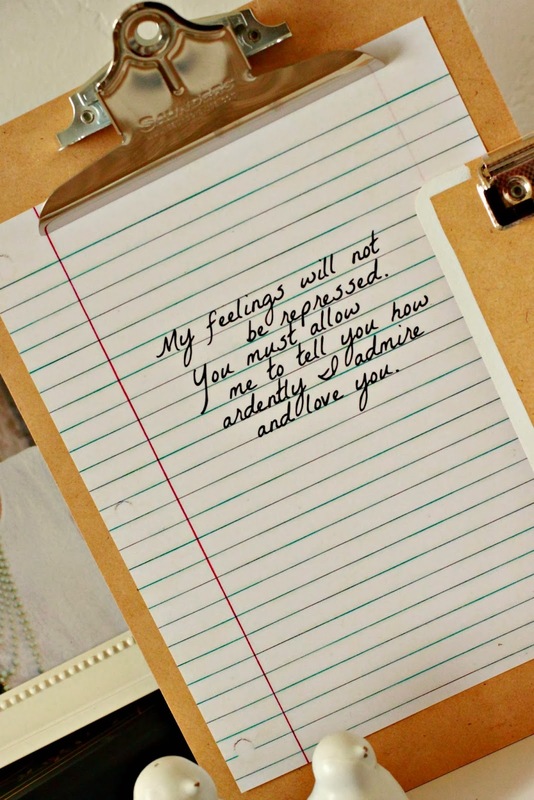 The great thing about this love note is that it is actually a photograph. I made this love note photograph using PicMonkey. I scanned a piece of regular notebook paper into my computer. Then I opened it up in PicMonkey and used one of my favorite handwriting fonts to "write" up one of my favorite romantic lines ever. Then I just printed if off at a photo center as an 8x10. The smaller sized clipboards are so cute. I just had to create something with one of them too. The Hubs and I got married in the Salt Lake City Temple. 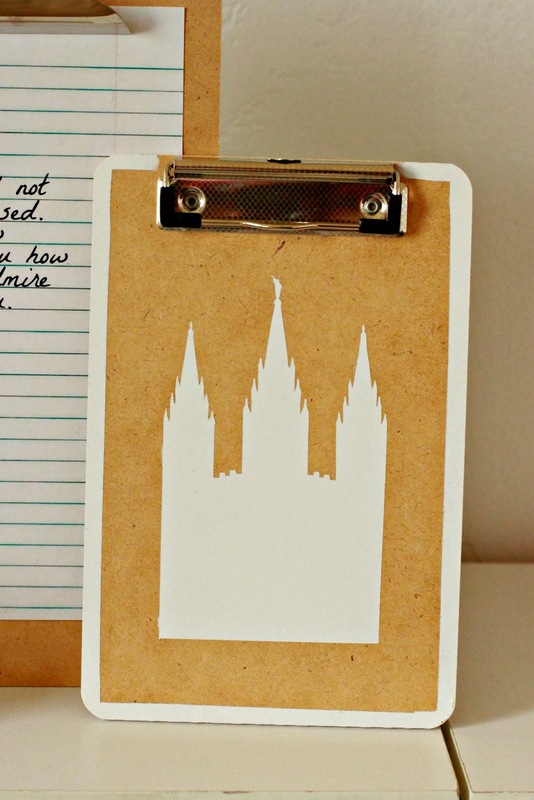 I thought it would be nice to add a silhouette image of the the Salt Lake City Temple to a clipboard. 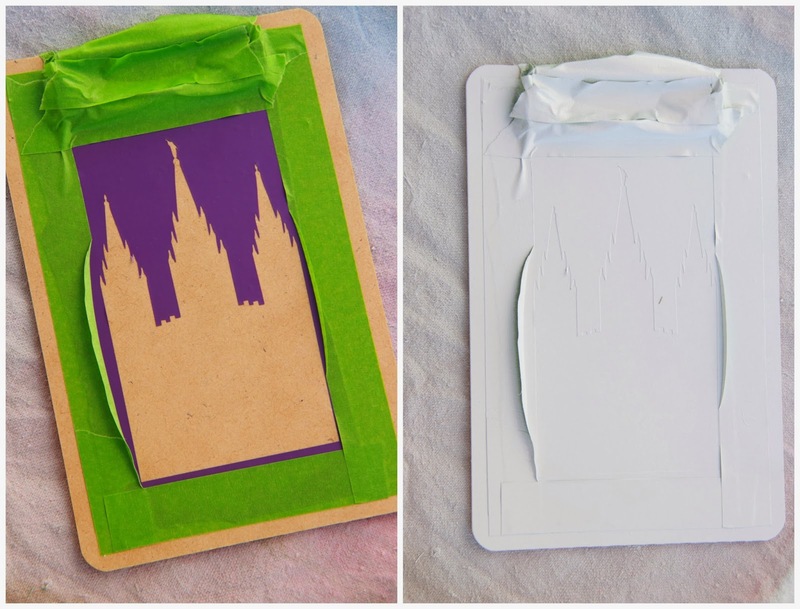 I cut out a stencil of the silhouette of the Salt Lake City Temple using my Silhouette machine. I stuck the vinyl stencil on to the clipboard. Then I used painters tape to cover all the parts of the clipboard I didn't want painted. I left a small boarder around the edge. Then I spray-painted until the coverage was how I wanted. The last thing you need to do is let it dry for a bit and then slowly remove the painters tape and vinyl stencil. With my clipboard art in hand, I can start decorating with it. So much love and cuteness in the air I can barely stand it. 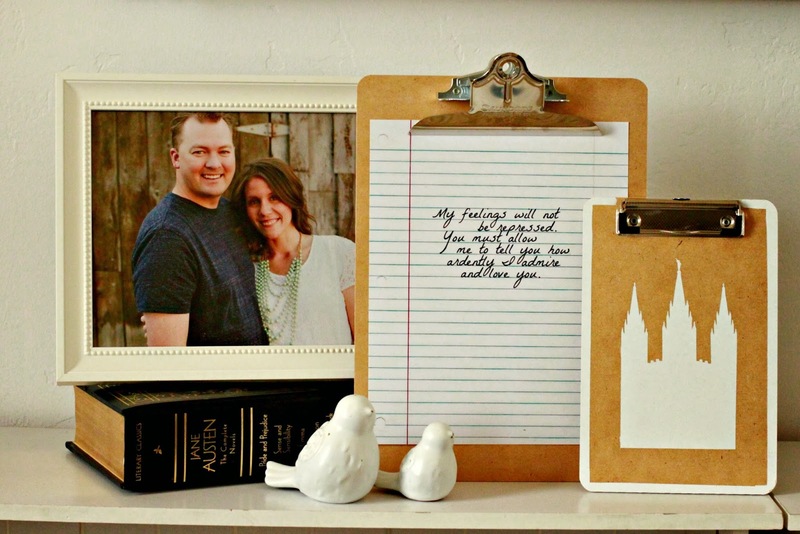 These clipboards would also look super cute in a wall collage...which just might be where they end up...hint, hint. Coming soon. Now off I go to watch Pride and Prejudice for the 1,000th time.